I'm so happy B decided to "fix" his PSP for I am having the best time with my Monsters Deluxe! This game takes on the concept of the PC game Monster Mash, which is equally fun. 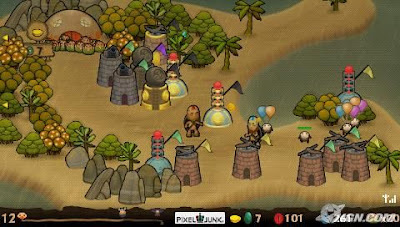 I am not too familiar with PSP games so B was the one who happily informed me about Monsters Deluxe and now I'm hooked! I've been so caught up playing MD for the past week that I've been neglecting all my other games including my usual online casino games, which is amazing because usually it is slots that I love the most when it comes to unwinding and relaxing. Slot games are extremely convenient to play. Unlike poker for instance, which always confuses me with tedious rules on how to play or the need to comprehend the concept thoroughly before you start playing, slots are effortless. Basically, all you have to do is place your bet, hit the play button, by clicking your mouse, and the slot reels will start turning. All's left to do is keep your fingers crossed and hope to WIN the jackpot! That's why I love my slot games. They keep me entertained and the graphics are usually so colourful and cute, which adds to the fun of playing slots in the comforts of my home-office whenever I want to de-stress! Speaking of de-stressing, I am looking forward to the Christmas holiday. It falls on a Friday so that means another 3-day weekend for us ... and more time for me to play my Monsters Deluxe! havent been a chopper for a long time!grrrrrrrrrrrrrrrrrrrrrrrrrr..! did i make this chop? GP ill be goin home! >:o >:o >:o >:o GG Monster 1! :* :* :* :* LJ!! At first I tot PSP not fun Mon… until I discovered my Monsters Deluxe woo hoo!!! B said I wouldn’t like GTA hehehhehe! Sorry.. tadi nak comment, then A came back and got to talking..
Lucky you and good for you. Hopefully one day when things are right with me, will try to discover more interesting stuff like playing games etc, itu pun bila I ada time. Sound good to unwind and relax one's mind taking you to a different dimension. Merry X'mas in advance, enjoy your holidays with all the meow, meow cute cats and you loving hubby. Wah Monster Mania? Macam Syiok jer game tu. Ehhh PSP dah okay ye? 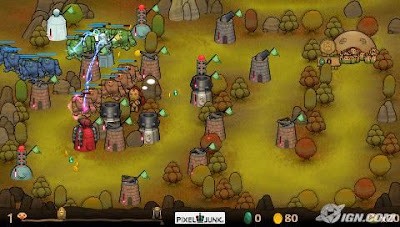 Monster Mania ni kira Tower-Defense Game Category kan? Marzie, dah cuba main Patapon? Sekarang ada Patapon 2. Very addictive. Main nanti you ll be singing - Pata Pata Pata Pon. Eh!!!!! B baru je beli Patapon cause he said I would love it but I still haven played cause still belum complete Monsters Deluxe!!!! Nanti I try woo hoo!